Figure 4.3. Serum immunofixation electrophoresis. (A) Normal serum. (B) Monoclonal IgGλ intact immunoglobulin. (C,D) Monoclonal IgDλ intact immunoglobulin with λ FLCs. Fλ: anti-free λ antisera. (Courtesy of Me Musset Hôpital Pitié-Salpétrière – Paris, France). 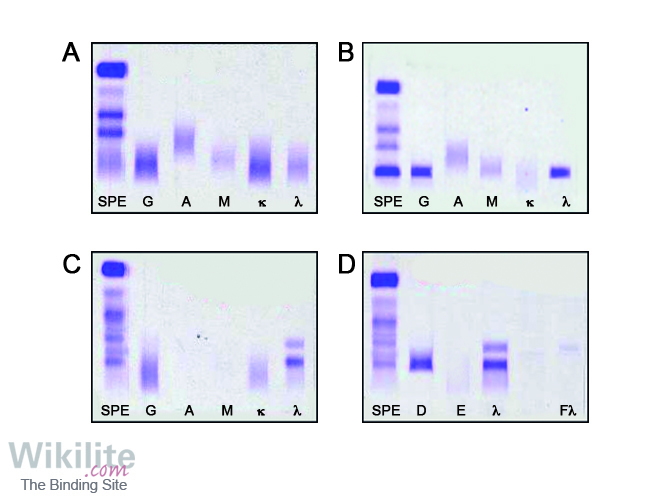 For sIFE, a patient’s serum is applied to several lanes of an agarose gel, and after electrophoresis, specific antisera are overlaid on individual lanes of the gel. 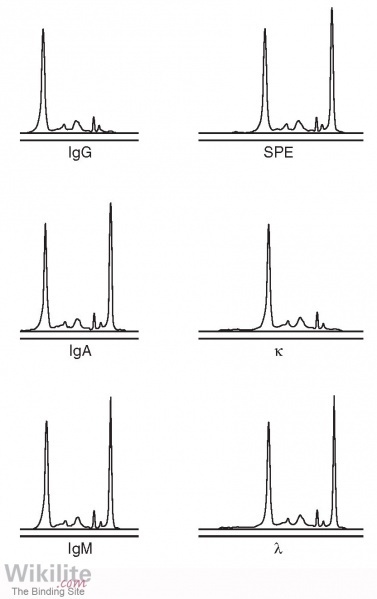 These antisera are typically against IgG, IgA, IgM, κ and λ, although other specificities may be useful for identifying unusual bands (e.g. IgD, IgE or fibrinogen). A lane fixed with acid (which fixes all proteins) is also included for comparison. Following removal of the antisera, gels are washed and stained with Coomassie Brilliant Blue or Amido Black (Figure 4.3). IFE is approximately 10-fold more sensitive than SPE, and is included in MM guidelines in the definition of a stringent complete response (Chapter 25) . It should be noted that judging whether there is or is not a discrete (monoclonal) protein band present after IFE can be subjective, and this may lead to discordance in the response category assigned by different operators (Section 18.4.3) .